Make an appointment today with us for a personalised consultation and a campus tour. The Tan Sri Ahmad Razali (TSAR) Merit Scholarship Award is offered to deserving Malaysian students who demonstrate excellent academic achievements and exemplary leadership attributes, participate actively in extracurricular activities, community involvement and have received outstanding recognition due to notable achievement. Named after the late Tan Sri Ahmad Razali (Chairman, Board of Governors from 1998 to 2001), The TSAR Merit Scholarship Award is only open to Malaysian students who are enrolled in any degree programme at UCSI University. The UCSI University Trust Sports Bursary is open to any Malaysian state or national athlete who enrolled in any of the degree programmes at UCSI University (EXCEPT for Medicine and Pharmacy programmes). Successful state athlete applicants will be awarded a partial tuition fee waiver while national athlete applicants will receive a full tuition fee waiver for the undergraduate study period at UCSI University. Applicants must be a State or National Athlete verified by the National Sports Council of Malaysia and the respective Sports Association. This education grant is offered to Malaysian new students of 2019 intakes to pursue degree programme at UCSI University (EXCEPT for Medicine and Pharmacy programmes). This education grant provides partial tuition fee waiver for the candidates who demonstrate good academic achievements and active participation in extracurricular activities. The education grant entitlement corresponds to the academic achievements obtained. Tuition fee waiver is to be granted for Degree Year 1. The UCSI University Trust Scholarship is offered to Malaysian students who demonstrate outstanding academic achievements, leaderships attributes and participate actively in extracurricular activities and community involvements. The UCSI University Trust Scholarship is open to Malaysian students who enrolled in any of the degree programmes at UCSI University (EXCEPT for Medicine and Pharmacy programmes). Apply now before 4th January 2019 for UEC Scholarships and before 19 January 2019 for Education Grant. 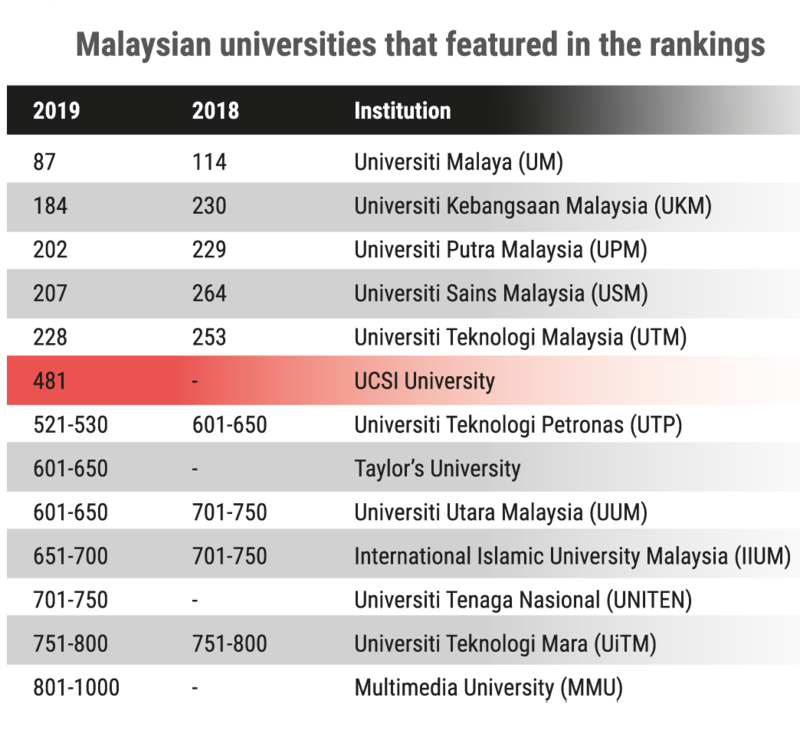 UCSI University stands out as Malaysia’s best private university in the QS World University Rankings 2019. It is a top six university in Malaysia – only UCSI and the nation’s five research universities made the global top 500 benchmark – and it is distinguished in the top 2% of all universities in the world. UCSI is also regarded as one of the world’s best universities, ranked in the top 70 in the QS World Top 70 Under 50 (2019) rankings that rates universities under 50 years old. At UCSI, we offer financial assistance to help you realise your highest potential and pursue your dream education. More than 35% of UCSI’s academic staff are PhD holders and a further 17% are pursuing their doctorate. The 2015 average at private higher education institutions in Malaysia is 16%. OVER 4,200 companies partner with UCSI to enable collaboration, internship arrangements and research opportunities. A total of 97.8% of our co-op partners would like to rehire UCSI interns. Spectacular increase in UCSI’s number of research grants, cumulative impact factor score and number of research publications from 2013 to 2016. © Copyright 2018. UCSI Education Sdn. Bhd. (185479-U). All rights reserved. A member of UCSI Group.